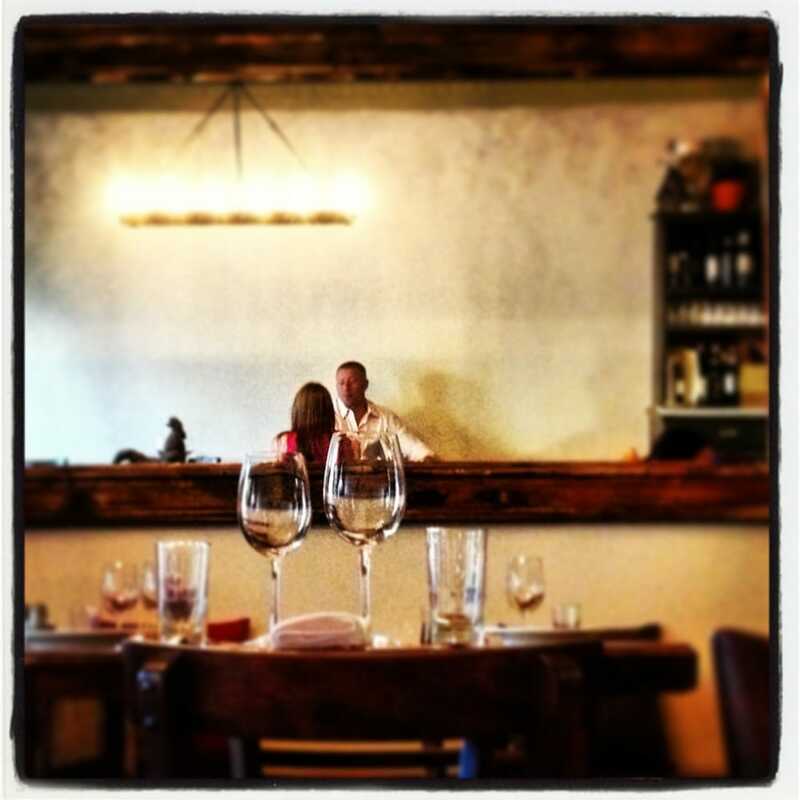 We are destined for a few more restaurants this week but had to try Piccola Trattoria, a newcomer to the HVRW family. 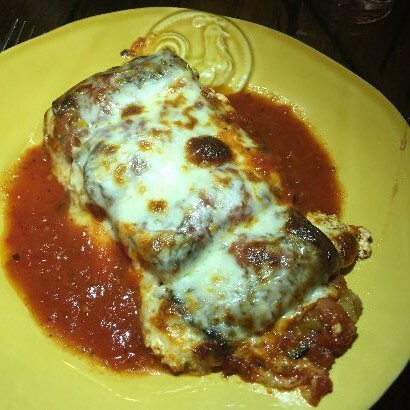 This authentic Italian restaurant, family-owned and operated since 1994, has been reinvented in the last year when family member Sergio Pennacchio took over to call it his own. 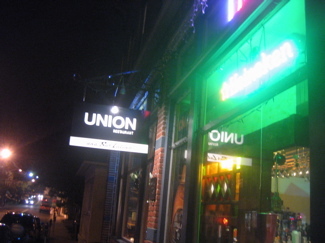 It is located next door to the old Pickwick theater on Cedar Street. Sorry folks, we were so excited about the delicious food that we did not snap many photos of the warm and cozy dining room. With seating for about 35, the atmosphere is both special and inviting. The soft lighting (but not too dark to photograph our lovely plates) made us feel both warm inside and out. The space is decorated modestly with touches of natural finishes including a wooden, communal table located in the middle of the dining room. (Picture taken from another positive review.) Hi! Donna Monaco Olsen here, coordinator for the Taste of Westchester Continuing Education program for WCC to share with you from a wonderful meal during HVRW 2015. On this evening four cousins decided to try a new player to the HVRW family (which currently offers over 200 restaurants). 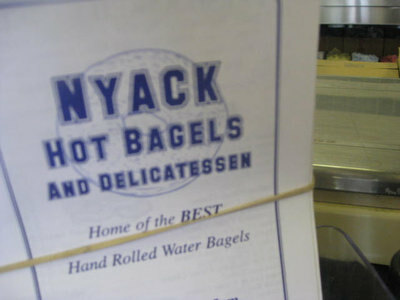 Being a food writer in Westchester, I like to explore new places that are not on my typical radar. I am asked to recommend places to dine by many of the attendees of my cooking classes. To our delight this will be a new recommendation that we will be sure to re-visit soon. Meeting Proprietor Sergio Pennacchio was a pleasure, personally and professionally catering to our every need. Authentic Italian food with flavors remembered from our childhood were delivered for each of the three HVRW menu courses. Here’s hoping that he will do a cooking class for WCC in fall 2015. 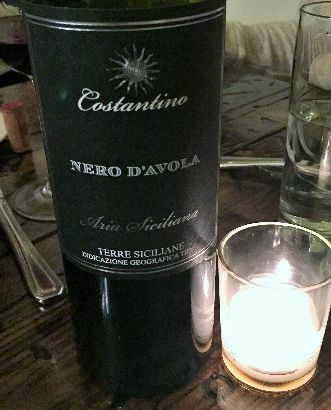 A beautiful Sicilian vino was recommended and enjoyed. It was nice that it was reasonably priced for our mid week dinner and accompanied the great HVRW value of 3 courses for $30. 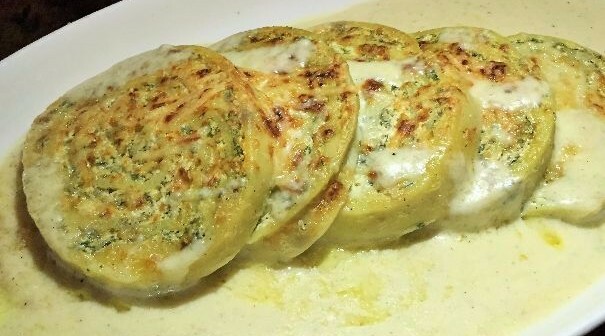 Melanzane Rollatina – rolled eggplant stuffed with ricotta and baked parmigiana style. We loved the rustic china dishes, all with a “chicken or rooster” theme and mismatched just like at home. You can see the rooster peeking out from our delicious eggplant. It reminded us of Auntie Philomena’s from long ago. The chef explained that he grills the eggplant and does not use flour or breadcrumbs to keep it gluten free. This also made it a very light version of what tends to be a heavier dish. A generous portion for an appetizer consisting of four rolls, and adorned by a fresh tasting marinara sauce, makes this a vegetarian friendly option. 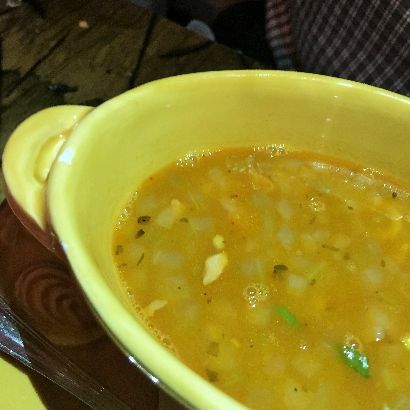 The soup of the day was Pasta Fagoli – small pasta shapes and beans in a light tomato broth. A delicious version served in an interesting oval shaped vessel. Flavorful and although usually heavy this was a thinner version and a perfect consistency on a cold rainy night. Each of us ordered a different entree and passed our dishes around. The more than generous portions allowed each of us to try them all. There were many other offerings that we wished we could have tried but we were drawn to the house-made pastas and each was a terrific choice. 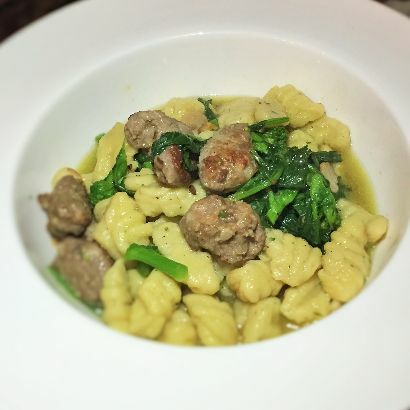 Gnocchi con Salsiccia – house made potato pasta with sausage and broccoli rabe. The rustically formed dumplings were light in a flavorful garlic broth. The sausage hit the salty notes and the greens were not bitter nor overdone. We have tried many versions of this same dish not always successfully yet all elements here were perfectly cooked. The pasta is also offered with a traditional Bolognese sauce. 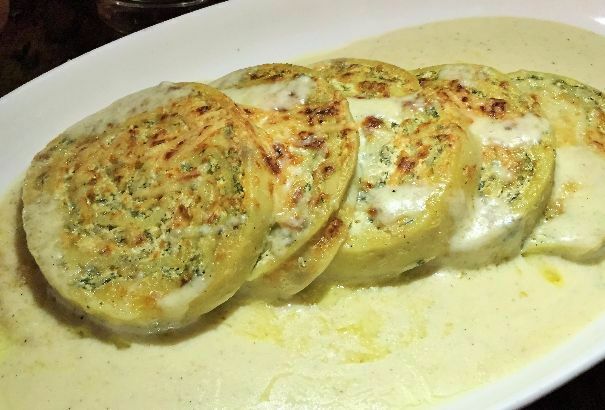 Rotola di pasta – rolled pasta stuffed with ricotta and spinach topped with béchamel sauce. One of the more different plates on the menu is the house specialty from the chef’s family recipe. This was a hit with all of us. The sauce that is heavier than marinara was velvety smooth with a hint of nutmeg and sharpness of Parmesan. It is then baked into the wheels of pasta. It is similar to lasagna by using sheets of pasta to create the stuffed rolls and can be ordered with tomato sauce in place of the cream sauce. 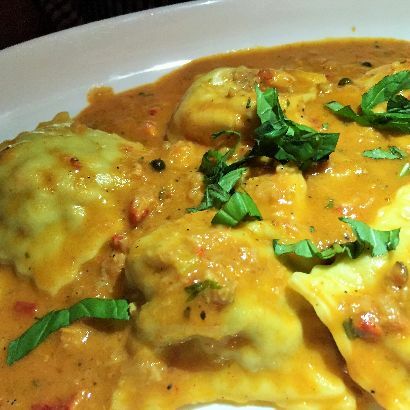 Ravioli da aragosta – house made lobster ravioli in a pink sauce. This dish hit all the flavors of Christmas Eve dinner many moons ago with lobster and tomato coming together to evoke memories of my holidays accompanied by 35 relatives enjoying a seafood extravaganza. This was a very full portion of eight adorned with a light pink sauce. I prefer a thinner pasta on my raviolis but my husband thought them perfect in every way. 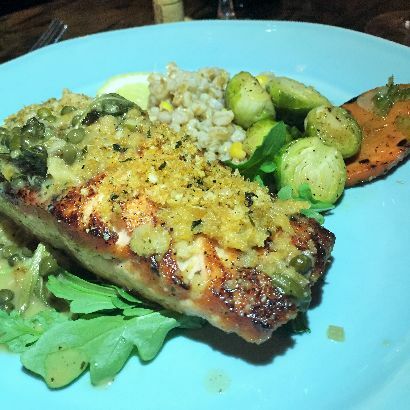 Pesce del Giorno – Fish of the Day being a crusted salmon with capers and farro. While this diner opted for the fish thinking he would eat “light” again our chef presented us with a delicious, nicely prepared and ample plate. Farro is a wheat based grain from Italy that is reminiscent of barley. The house specialty, not featured that night, is Branzino, which I have heard is prepared to perfection. 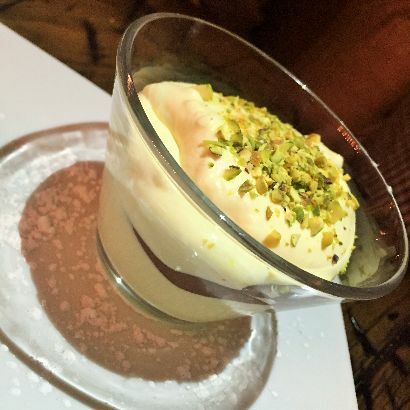 Mascarpone sabayon with Nutella and pistachio nuts. 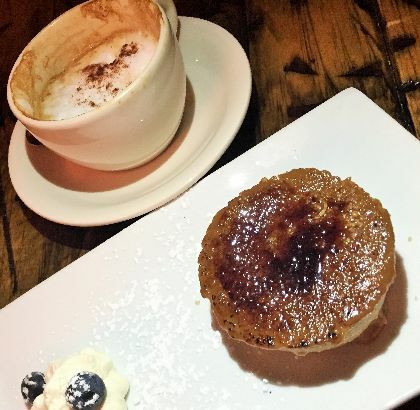 Espresso crème brulee. Although delicious, this coffee fanatic would have loved more coffee punch. That said, the combination of the creamy consistency being not too gelatinous and the crunch of the burnt sugar was perfection on a plate. We loved our meal and would definitely revisit very soon. We were made to feel most welcome by the owner and appreciated his attentiveness. This restaurant also offers a nice perk not seen often on regular lunch menus. Along with their delicious pastas, everyday for lunch they include a soup or salad with your selection, making it a good value any time! As a contributing blogger and the author of "Chef’s Tip", Donna Monaco Olsen recaps great cooking demonstrations from local restaurants. As the the coordinator for Westchester Community College’s Continuing Education program, named “A Taste of Westchester,” she writes the program, which offers more than 35 cooking classes each semester, and recruits chefs to do cooking demonstrations in their restaurants. She holds a full time position in the education field, and in her off time develops and contributes recipes for cookbooks. She is an avid baker and a former cake decorator who created many custom designed specialty cakes. Along with her husband, she reviews restaurants on Small Bites during Hudson Valley Restaurant Week.